Atunwa is reincarnation, according to Yorùbá theology. It is one of the single, most important principles of our belief system and world view. In fact, it is absolutely safe to say that, “if you do not understand atunwa, nothing else you do in the Yorùbá religion will make any sense at all.” Contrary to popular belief, òrìsà worship is not about the accumulation of power and wealth. It is not about amassing libraries of knowledge, colorful beads and countless pots. Yorùbá religion has absolutely everything to do with establishing a balance between heaven and earth. In this way, we can see that Yorùbá religion is concerned with strking balance and harmony between heaven and earth. Afarabale, which encapsulates self control, composure, gait, manners, diplomacy, “an authority that emanates from an undisturbed calm” is very important to the Yorùbás because it is only by being well-seated in this sanctuary of undisturbed calm that one can pay proper attention to all the elements of life and understand their symbiotic relationships. The most important of all relationships are those associated with family. Traditionally, where you live, your political access, your spiritual discipline and profession are all influenced, if not defined by your family lineage. The Fon people of Benin call the founding ancestors of each lineage towiyo, each of whom was born under the influence of a particular Odù Ifá. So, in the same way that creation myths serve as charters that legitimize each king’s right to their respective thrones, they also detail the spiritual foundations and earthly missions of each towiyo and his descendants. In this way, the Yorùbá-Fon family is, in effect, the nucleus of all political and religious activity in the community. The towiyo is the family’s patron saint or principle deity. His descendants adore and worship him as their spiritual guide and support. “It is the duty of the head of the [family] compound to make an annual sacrifice to the founder to insure the prosperity of the members for the coming year. This is done on the day that the founder is said to have sacrificed to his orí (destiny) when he himself was alive.” And in the same way that Olódùmarè delegated to each òrìsà his or her dominion, He also assigned to each towiyo to a lineage, made up of many families, to embody the power of the òrìsà. 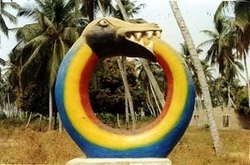 The towiyo are emissaries of Olódùmarè. Their mission and greatest concern is to continually increase the predominance of harmony and balance among and between family members. Furthermore, whereas the towiyo is the spiritual father of an entire family clan, each individual is more closely sponsored by a guardian ancestor. The Fon call this sponsoring ancestor the djotò (also called sedjotò, medjotò), ‘agent of birth’ (jo: born, arrive, remember; and tò: father, actor, agent, master). He is the force, the vital and spiritual energy, which models and directs the existence of the person; hence the title Se (Protector) that is given to him. The djotò is “Father of the coming into existence”, the direct collaborator of Mawu (God) in the generation of the child. The djotò then, is an ancestral guide and protector. Most importantly, that which he protects is the spirit, who is making the journey “from heaven to earth” to continue the mission started so many hundreds of generations ago. Ifá says that, with each passing generation, our mission is to gradually improve human character, to purify our souls, to improve conditions on earth until it is perfect once more.